I'm always asking people in my family for Mom-isms they remember hearing and using. Last weekend, my brother-in-law Phil shared one that my father-in-law had written in his Bible. I think it's very relevant for back then when he wrote it down and now. Very simple and direct. The dad-ism needs no explanation other than to read it. Phil is not sure where or why the saying originated. The more surprising story lies in how my father-in-law obtained the Bible he wrote it in. My father-in-law affectionately called Pop was at Lake Conasauga in the 1940's probably fishing. He found a tackle box. The box had a name and address in it. Pop mailed the tackle box back to it's owner. In appreciation for returning the box, the man sent him a Bible as a gift. It's the very same Bible this week's Mom-ism Monday #17 saying is written in! 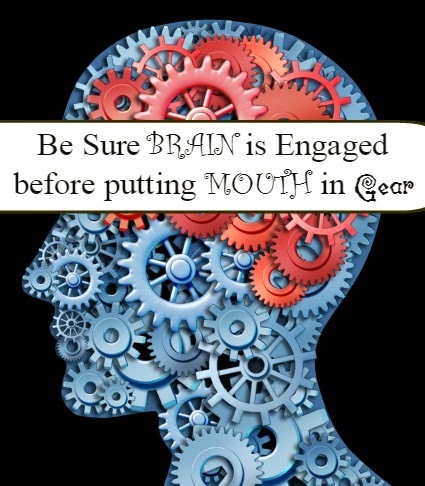 The next time you're feeling flush and think you might be getting a case of word vomit, remember this: Be sure Brain is Engaged before putting Mouth in Gear!